Are you struggling to understand how the new tax law will affect you? That’s not surprising, considering the new law – passed late last year – represents the first significant tax overhaul in more than 30 years. Income Tax Brackets: The new law retains seven brackets and provides for generally lower tax rates. All individual provisions are effective for the 2018 tax filing year. Standard Deduction: The standard deduction is roughly doubled to $12,000 for single filers and $24,000 for joint filers. Primary Residence: Homeowners who remain in a home purchased on or before Dec. 14, 2017, are grandfathered and maintain the $1 million mortgage interest deduction threshold. For primary residences purchased after Dec. 14, 2017, the limit for mortgage interest deduction drops to $750,000. This change will likely impact home sales in markets with above-average home prices. For homeowners in less-expensive housing markets, opting not to itemize and instead taking the new standard deduction may make better financial sense. State and Local Taxes (SALT): Homeowners may itemize up to $10,000 for the total of state and local property taxes and income or sales taxes. 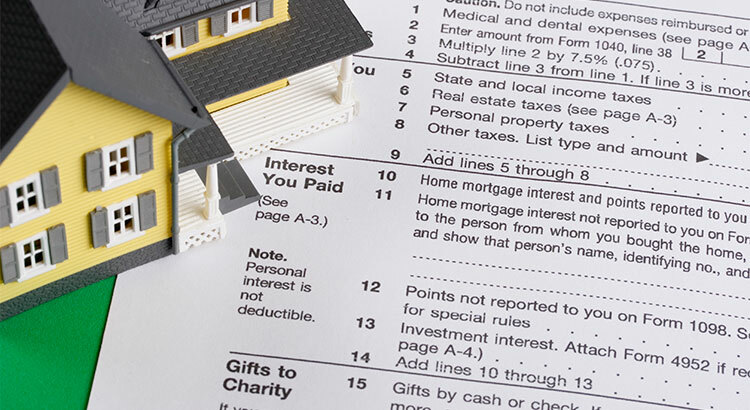 Previously, homeowners could deduct all taxes paid. Homeowners in high property tax states may find a portion of their tax bill to be nondeductible. Capital Gains: The deductible amount remains at $250,000 if filing single and up to $500,000 if married filing jointly – if the homeowner has lived there for two of the previous five years. Refinancing: Homeowners may refinance mortgage debts up to $1 million and deduct the interest if they owned the home on or before Dec. 14, 2017, and the new loan does not exceed the amount of the mortgage being refinanced. Secondary Residence: Interest paid on second home mortgages is deductible but is subject to the $1 million limit for homes purchased on or before Dec. 14, 2017, and $750,000 for homes purchased after. Home Equity Debt: Home equity loan or line of credit interest is no longer deductible. Previously, interest paid was deductible for debt up to $50,000 for single filers and $100,000 for married filing jointly. Interest is still deductible on home equity loans (or second mortgages) if the proceeds are used to substantially improve the residence. Moving Expenses: Moving expenses are no longer deductible except for members of the military. There’s still a lot to be learned about the new tax law. Always consult a tax professional for questions specific to your unique situation before you buy or sell a home.